Its Winter…I am enjoying..as its one of my favorite season, so what if its brrrrrr cold outside, I was not going outside & mostly were enjoying at home while creating & making fun, so its the perfect time to craft & create without getting bored.. Well its cold here, mornings are foggy & days are sunny with cool wind coming from Margalla hills I guess.. & the evenings & nights are more cold..I am waiting for the rain but I don’t know why there is no perfect rain of winter yet.. I want snowfall too but it never comes here in the area where I am living..ahh.. let’s see..Well whatever the weather is, I wish its filled with happiness & success with the blessings of Allah Almighty.. 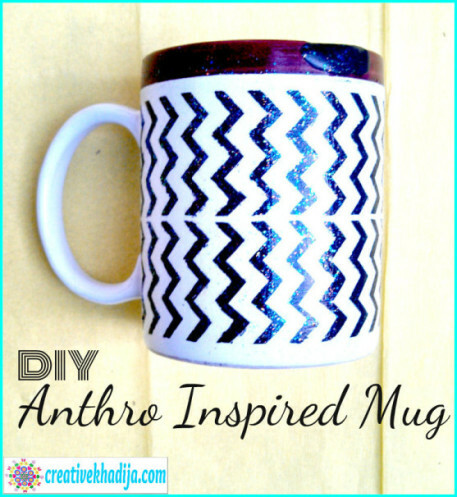 I have shared many anthro inspired accessories in the past, so today again I am going to share something inspired by anthropolgie. so come on to the today’s post now! I am going to share a wrist accessory tutorial today..Wrist accessories are always catching my interest more than any other jewelry stuff, do you like bracelets & cuffs? 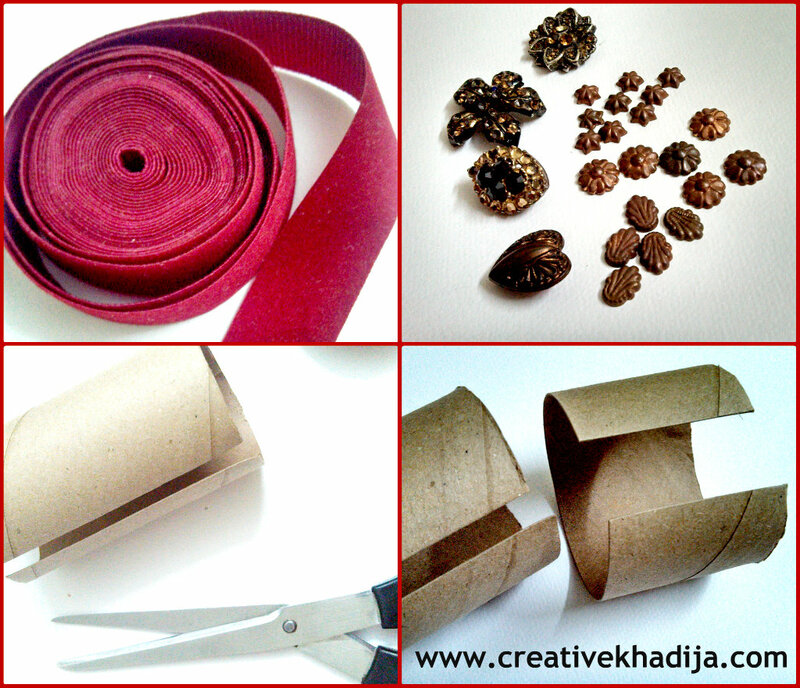 If you like them, then definitely you would like to learn the making of these accessories for creating wrist accessory for yourself or for gifting others too.. So let’s have a look at what I am sharing today! 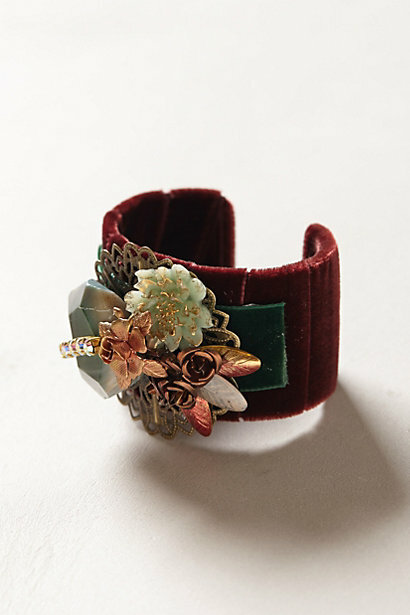 While browsing around and checking the Anthropologie webpage, I saw a navy blue velvet cuff which was looking so pretty, that was wrapped with navy blue velvet. so I like that & thought to try. 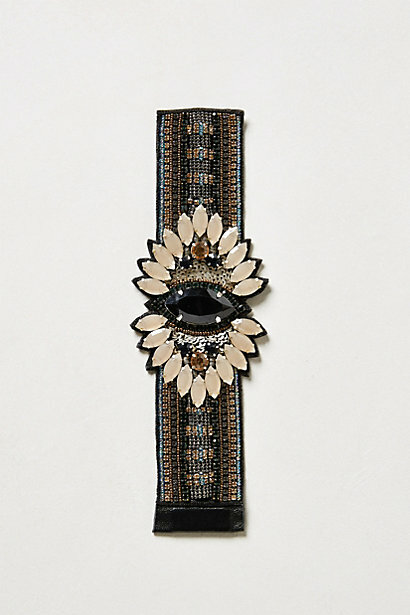 the other day when I open the Anthro’s page, that velvet cuff was replaced with this above two cuffs, that was may be sold so they place another cuff there. 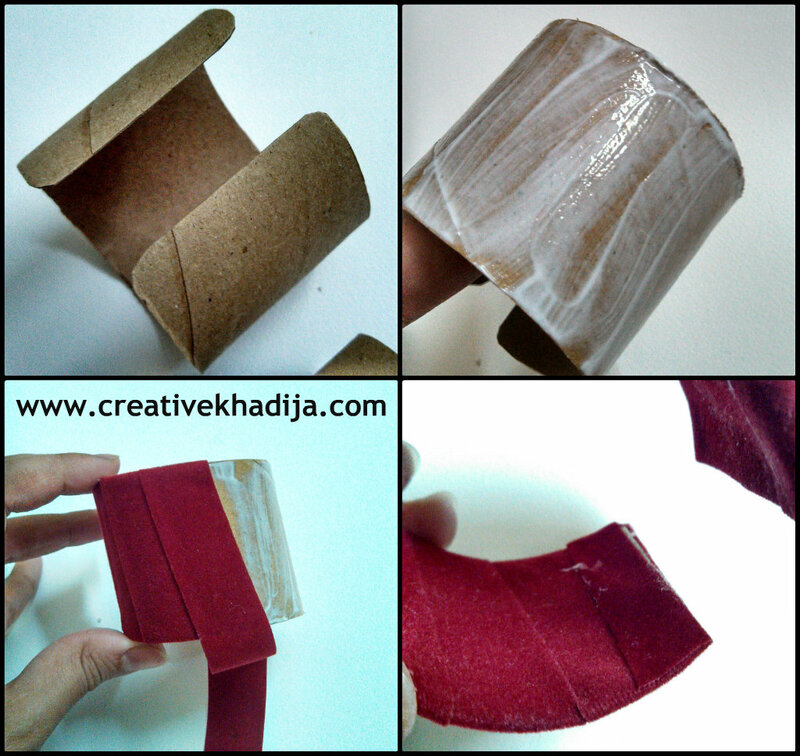 but I was inspired by that velvet cuff so I tried my version, its super easy & fun idea of making a cuff. See what I have done! the making is easy & isn’t it beautiful? 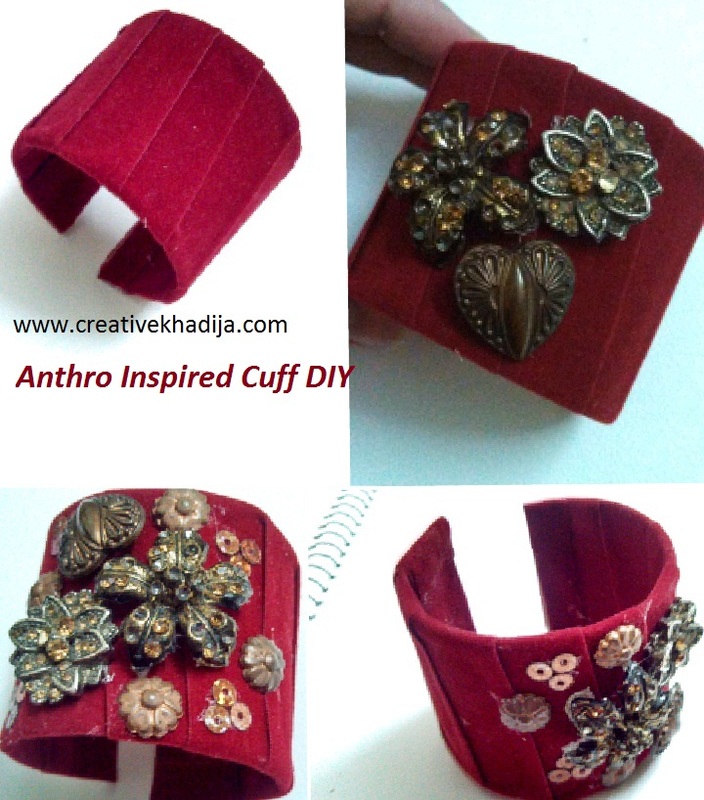 a quick & interesting version of antho’s cuff.. for its making you will need to have a few things only.. see the how-to below..
TP roll, Velvet Ribbon, Scissors, Glue, (Mod podge & hot glue) Antique sequins & embellishment. 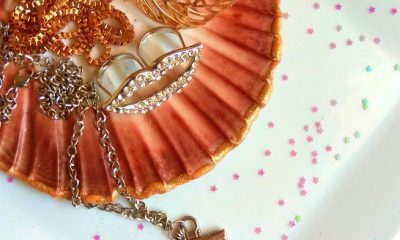 Whenever any jewelry piece is broken or damaged by chance, I save that in my crafty closet for any craft idea. there are many rhinestones & bling accessory pieces are saved in one of my decoupaged box. I reuse them in my crafty activities mostly. 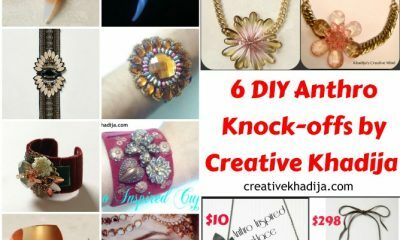 So never throw your ordinary little broken jewelry specially, they can be useful again in other craft projects of yours or while working with kids crafts etc.. So first of all I gather my crafty stuff for this project & then, I cut the TP roll from its center & then round the edges by cutting some more from sides. After making its cuff shape, then cover it with a thick coat of mod podge, and start wrapping the cuff with velvet ribbon which is about one inches wide. cover the card paper tube with velvet ribbon & when you will be reaching near edges then cover the space of tp roll with cuff totally. Now Let it dry and then fix the big metal jewelry pieces first, then small sequins & all little thingies you want to embellish. I gather the stuff which is vintage & antiques inspired. so its contrast with dark red velvet seems well. That’s it. the cuff is ready! While working with hot glue gun, you must be careful. as it can be a kid craft too so kids must be careful. The strings of hot glue were sticking with velvet but you I try to manage well. its not easy to work with glue gun sometimes. Well if you are going to try this project with your kids, you must be careful as it can burn the soft skin of kids. it will be an easy & beautiful kid craft. a gift idea for the girls who want to share anything handmade with others. 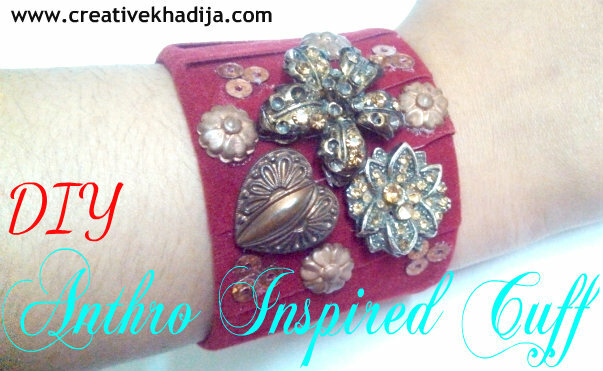 so creative ..loved your idea and execution. . it turned to beautiful bracelet khadija.. :) thanks for sharing. .
Loving this Cuff.. The finishing is really pretty and neat. wish to give a try. 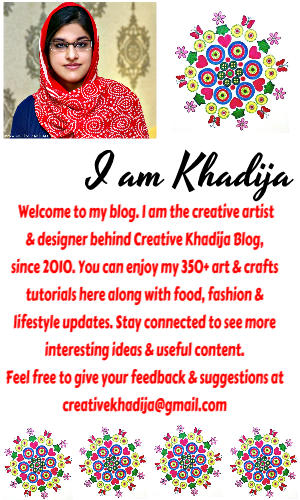 Very beautiful, creative and neat work, Khadija! 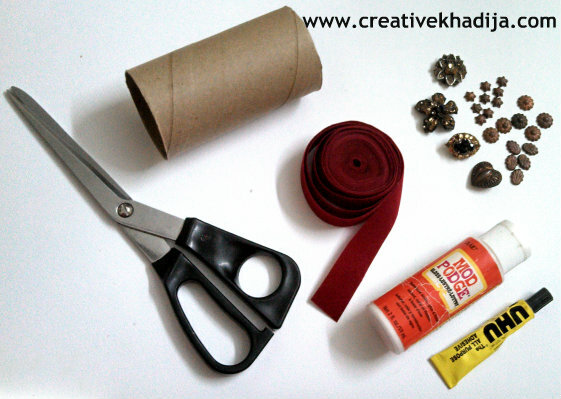 looks nice kiran…does a TP roll bracelet hold its shape after being worn a couple of time? Oh my gosh! This is genius! Love it. visiting you from Ladybug Blessings. Great tutorial and I love what you have done. The antique look is amazing. Hola amiga! !…muchas gracias por tu visita y comentario. He logrado superar el problema con el robo de identidad en uno de mis blogs… al fin! Saludos y buenos deseos para ti. Such a wonderful idea! Both so fantastic and budget friendly too, what’s not to love? I LOVE it:-) Have a happy day dear Khadija! Looks great! Would love to have you share at Link’n Blogs link party. HOLA KHADIJA !!!! ME ENCANTA ESTE TUTORIAL , Y COMO HA QUEDADO ESTE BRAZALETE TAN PRECIOSO…. MUCHOS BESOS, AMIGA KHADIJA. I love this! 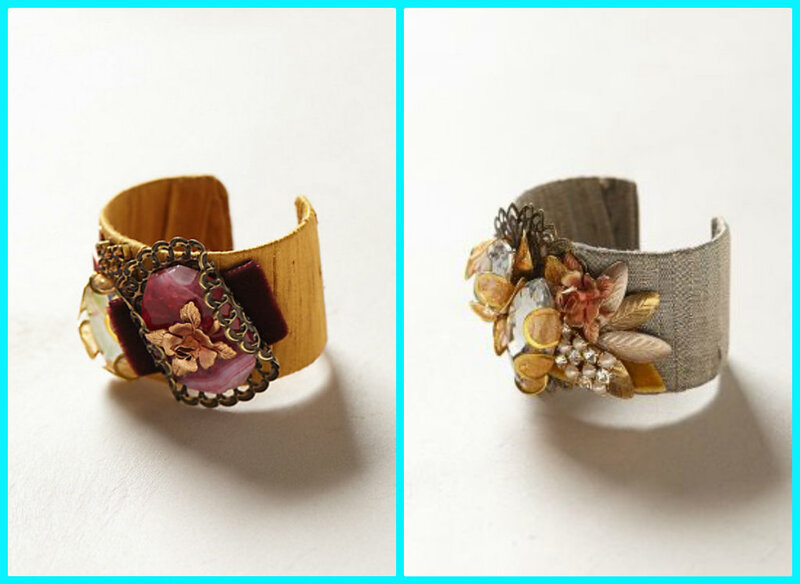 It’s amazing that you’re making these cuffs with toilet paper rolls. It’s such a waste to just throw them out when you could create something beautiful out of it. Thanks for linking up to the Tuesday Confessional link party. You’ve been featured, so head over and grab a brag button! such a neat DIY project. It looks great. That’s so pretty! I can’t believe the base of it is a tp roll!!! 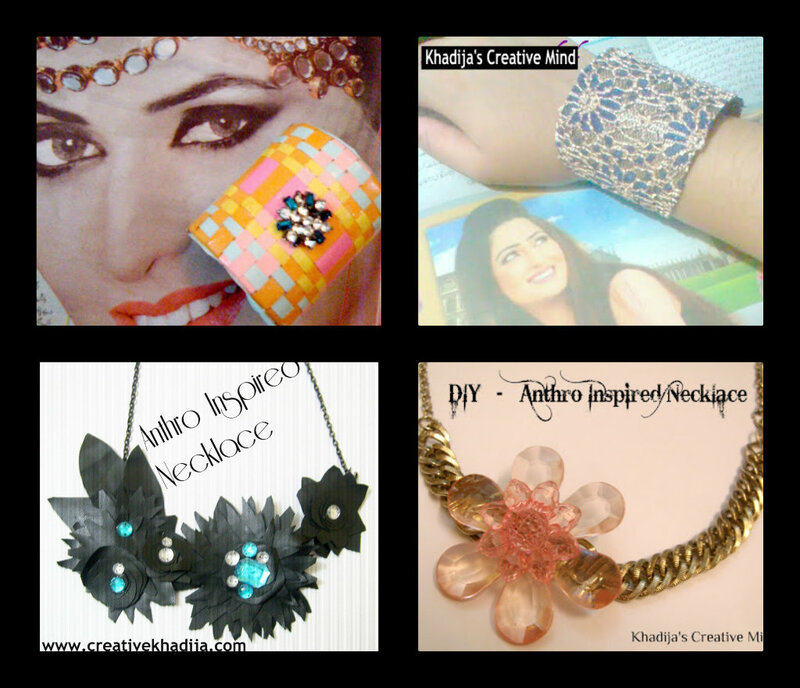 Thank you so much dear friends, for admiring & for featuring my ideas.. Thank you! So cute and simple! I would love to have you hop over and share with us at Tell Me About It Tuesday! So cute and EASY! My daughter has been wanting to get into jewelry making. I will share this with her. Thanks so much for sharing this on Tell Me About It Tuesday. Looking forward to seeing what you share tomorrow! Cute cuff! 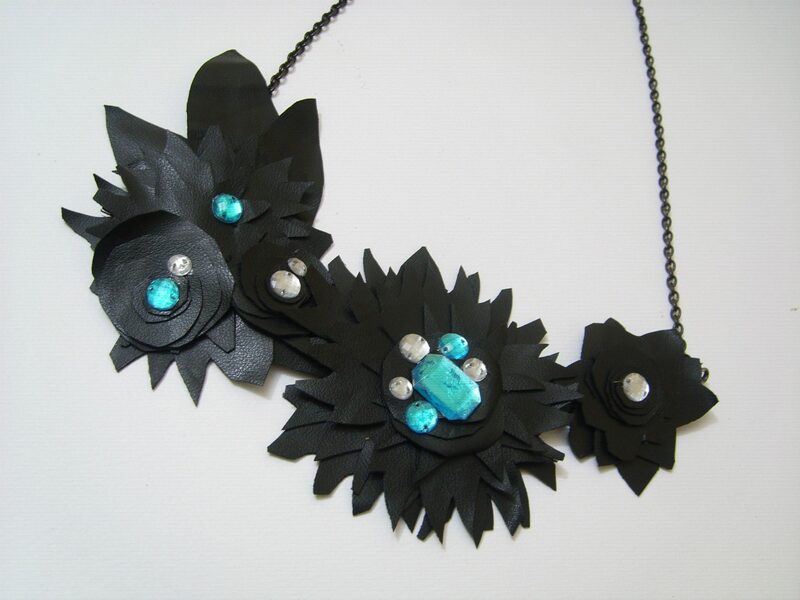 Such a great way to recycle broken jewelry! Great idea! Thank you very much as you visit my blog and thanks to all comments! I love to recycle, and making these bracelets delighted me!